Robert Knox was educated in Edinburgh before joined the army as a surgeon. In 1820 he met Georges Cuvier and Étienne Geoffroy Saint-Hilaire in France. In 1822 he returned to Edinburgh where he became famous for his brilliant lectures on anatomy at the University of Edinburgh between 1825 and 1841. In 1823 he married Mary Russel. Knox also taught at the Barclay's School of Anatomy when in 1826 he bought several bodies meant for dissection from Burke and Hare. It turned out they had not stolen the bodies from cemeteries but murdered their victims and in 1828 they were put on trial. Hare was offered immunity if he testified against Burke and Burke was subsequently executed on 28 Jan 1829. Knox himself was implicated, but he didn't have to give evidence since Hare had testified that Know knew nothing of the origin of the bodies. His wife died in 1841 and in 1842 Knox moved to London where he held the position of pathological anatomist at the Cander Hospital in Brompton, London. 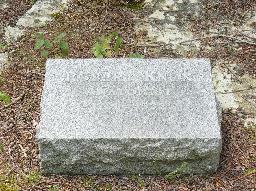 When he died in 1862 he was buried at Brookwood Cemetery near Woking. The block on his grave was placed there in 1966. The grave of Robert Knox at Brookwood Cemetery, Woking.